Robert Rabbin began his professional journey in 1985, after spending 10 years living and working with meditation master Swami Muktananda. Since then, he has developed an international reputation as a uniquely brilliant speaker and public speaking guru, as well as a distinguished self-awareness facilitator, leadership adviser, and personal mentor. 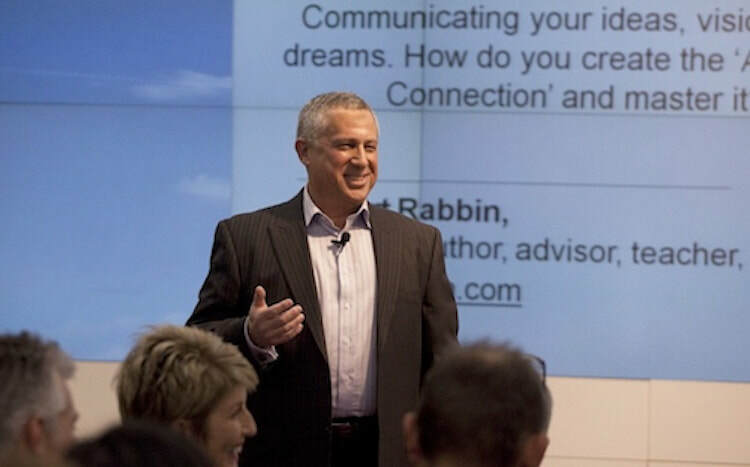 Robert is the creative source and director of Speaking Truthfully, through which he offers keynotes, masterclasses, and private mentoring in authentic self-expression and public speaking. He has published eight books and more than 250 articles on authentic living and public speaking, leadership, self-inquiry, spiritual activism, and meditation. In January 2012, he was diagnosed with "terminal" stage 4 lung cancer and told he had a few months to live. However, in keeping with his contrarian nature, he continues to thrive past the predicted use-by date. He lives in Los Angeles. His website is: www.robertrabbin.com .